I recently accompanied a client for a sea trial aboard a 44-foot trawler they were considering purchasing. As sea trials go, with a few exceptions it was unremarkable. The vessel left the marina on a brilliant, sun-drenched fall day with the current owner at the helm. Aboard were the prospective buyer, a surveyor, and I. One of those exceptions was the additional passenger: an experienced mechanic who brought with him a variety of tools, instruments, and test equipment. Anyone who has read my articles or attended my lectures will recall that I&apos;m a strong advocate of the prepurchase survey for used vessels, as well as new ones. Insurance companies and lending institutions nearly always require a survey in order to secure a loan or insurance for a used vessel. It&apos;s understandable; these entities need to be confident about the condition of the vessel for which they are providing their respective services. But why would a survey be required for a new vessel? Regrettably, builders of new custom and production boats - even the best ones - make mistakes. As the buyer, you certainly want to know about these mistakes before signing on the dotted line. If you&apos;ve been alerted to these building errors, defects, faults, or simple oversights aboard any vessel, new or used, you are in the enviable position of being able to negotiate for their correction, or compensation, before steaming away from the builder&apos;s or broker&apos;s dock. As a former boatyard manager and as a marine consultant, I&apos;ve been involved in countless vessel acquisitions and sales. I&apos;m often surprised by how many buyers will complete, or consider completing, a sale without having the engine and generator carefully inspected and tested by a trained mechanic as part of the prepurchase survey or inspection. Nearly all surveyors are quick to make it clear in their reports, and rightfully so, that the survey excludes all but the most cursory of inspections of engines and generators. Some will record serial and model numbers; others will go so far as to test wide-open throttle (WOT) readings and fully load the generator and include these results in their written report. 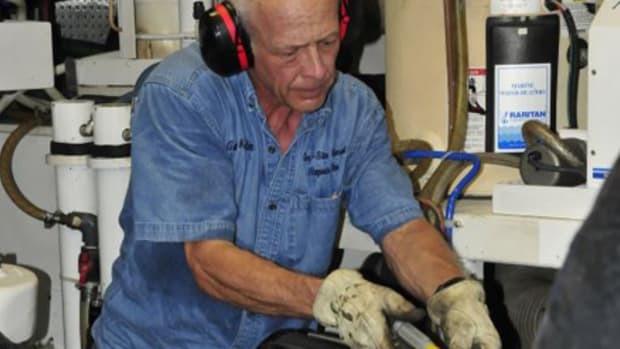 But few, if any, will carry out thorough, detailed testing of an engine installation that will offer meaningful information for the buyer-information that may come as a revelation to the seller and may spell trouble in terms of reliability, efficiency, or longevity down the boat-ownership road. It&apos;s worth reiterating that, just like surveys, the following engine analyses apply to usedand new vessels. As previously mentioned, even a cursory engine survey, which requires no special tools, instruments, or equipment (and therefore you can carry out yourself), should include a WOT run to confirm several performance parameters. Initially, it will confirm that the engine and propeller are properly matched. Additionally, the WOT run will confirm that the engine is capable of producing maximum rpm for a sustained period of time without overheating, starving for fuel or air, or experiencing other problems such as smoking or vibration. How long should the engine be operated in this manner to carry out the tests? My preference is to perform a WOT run for 10 minutes and then back down to cruising rpm, typically 80 percent of WOT, for an additional 30 minutes. If the seller, broker, or builder is reluctant to operate the engine(s) under these conditions, then he or she is either uninformed or has some concern about the boat&apos;s ability to perform, which in turn should raise your level of awareness and concern. Nearly every major marine diesel engine manufacturer warrants its engines&apos; ability to operate at full throttle for 10 minutes (and often much longer) without encountering the aforementioned problems of overheating and air and fuel starvation, provided the engine is properly installed and, in the case of used vessels, has been well maintained. Before conducting your own engine survey, arm yourself with a copy of the specifications for the exact engine model you&apos;ll be running, including its duty rating or "M" rating. (The M rating is a measure of an engine&apos;s ability to operate for a given duration at WOT, and at its presumed seasonal use; ratings range from M1 through M5.) These specifications will also include, among many other things, the WOT rpm, proper coolant temperature, and oil pressure. If the engine fails to meet any of the prescribed parameters during the sea trial, the cause may be as simple as a fouled propeller or as complex as excessive back pressure, a fuel restriction, air inlet restriction, or shaft misalignment. The professional mechanic who accompanied me on the sea trial I mentioned earlier offered the buyer the greatest insight into the condition of the vessel&apos;s engine and generator. His analysis and testing, however, began long before getting under way. While the engine and generator were still cold, he carried out a thorough visual inspection of the installation, carefully comparing it to the requirements set forth by the engine and generator manufacturer. Among the things he confirmed during this inspection: that the exhaust system was arranged in such a way as to preclude any chance of water backing up into the engine&apos;s cylinders (one of the more common engine installation faults), that the cable used for the engine starter was of the correct gauge, and that the motor mounts were tight and not overextended. He then ran the engine briefly to warm it, shut it down, and removed all of the injectors to test the compression of each cylinder. (Compression tests are advisable on all but new engines.) Once this test was completed, he attached to the engine a variety of gauges and meters as well as a laptop computer, which interfaced with and gleaned information from the engine&apos;s electronic control and management computer. While under way, this would allow him to measure everything from exhaust gas temperature and pressure to raw-water inlet restriction or vacuum, and fuel and turbo boost pressure. He also measured engine room temperature and the temperature of the exterior of the exhaust system, both wet and dry, in several locations. (Most engine manufacturers include a maximum allowable difference in temperature, or delta T, between the engine air inlet, measured at the air filter, and the outside air of 30°F.) ABYC&apos;s voluntary guidelines state that no portion of the exposed exhaust system should exceed 200°F. While the underway portion of the engine analysis is being carried out, it&apos;s vitally important that the vessel be in its "normal operating condition" - i.e., all hatches and access ports to the engine compartment must be closed. I&apos;ve been aboard numerous vessels during engine surveys and never cease to be amazed when a mechanic sets up his or her instruments and laptop in the relative comfort of the air-conditioned cabin, with wires and hoses leading through an open hatch or door into the engine room. Make no mistake about it; this practice thoroughly invalidates several parameters of the testing, including measurements of the engine air inlet delta T and engine room "depression," or the potential vacuum created within an engine room when there is an insufficient cross section of intake vent surface area. Most engine manufacturers clearly specify the number of square inches required for each engine model (don&apos;t forget the generator in this calculation). The final step in the engine survey process involves drawing samples of engine and generator crankcase oil and coolant, as well as transmission fluid, for laboratory analysis. Fluid and oil analysis, which I discussed in detail in the December 2007 issue of PMM, is the mechanic&apos;s and boat buyer&apos;s crystal ball. It can alert you to a variety of engine maladies, ranging from worn-out bearings to leaking head gaskets and everything in between, often long before any visible signs are apparent-even to an experienced mechanic. In my experience, the fluid analysis offered by engine manufacturers (and consequently by their dealers) is adequate, but it&apos;s far from thorough, complete or, most importantly, easy to understand. Choosing your own oil analysis laboratory and providing sampling kits and pumps to the mechanic carrying out the engine service, who then returns them to you for shipment to the lab, maintains your "chain of custody." You know the samples have been sent, and the results are returned directly to you. Perhaps the most valuable aspect of utilizing your own lab is the expediency and reporting method; most commercial fluid analysis labs will email results directly to you within 48 hours of receiving a sample. A final caveat where fluid analysis is concerned: when samples are drawn, it&apos;s critically important that cross-contamination be avoided. Using the same tube to draw oil or coolant from multiple engines or transmissions is strictly prohibited. Most labs sell inexpensive fluid analysis kits, as well as vacuum pumps and rolls of one-time-use pickup tubing. The same tube, even if it&apos;s been blown out, drained, or otherwise cleaned, must never be used more than once because of the risk of introducing contaminants from one sample to another, thereby surreptitiously invalidating the results. I&apos;ve watched mechanics commit this tech sin on several occasions during engine inspections and have had to insist on resampling. If you are planning to purchase a boat, a thorough inspection of the engine and generator installation is a virtual necessity. Without it, you simply have no way of knowing the condition of these expensive and vital components. Steve owns and operates Steve D&apos;Antonio Marine Consulting (stevedmarineconsulting.com), providing consulting services to boat buyers, owners, and the marine industry.